Four Seasons at Monmouth Woods is an active adult community in Howell, New Jersey. This 55+ community will feature 251 single-family, low-maintenance homes upon completion, offering residents beautiful new construction homes in the highly desirable area of Monmouth County, New Jersey. This age-restricted community in New Jersey is also slated to offer terrific amenities sure to keep homeowners as active as they want to be. Current plans call for a clubhouse to act as the social center of the neighborhood. This 6,830 square-foot structure will boast meeting rooms and social lounges for resident get-togethers. There will also be a billiards room for enjoying a low-key afternoon with friends. A fitness center will be available for staying in your best shape. This 55+ neighborhood will also have sterling outdoor amenities to keep residents active. There will be an outdoor pool, a kiddie pool for the grandkids, and a patio for relaxing on sunny days. Enjoy some friendly competition on the tennis or bocce ball courts. A putting green will also be on hand for practicing your short game. Residents here will also have parks and ponds throughout the community, making Four Seasons at Monmouth Woods a beautiful place to call home. K. Hovnanian brings their sterling reputation for developing beautiful homes to Howell, NJ. K. Hovnanian will develop this community with 12 separate floor plans. Four will offer lofts while eight will have single-story living. 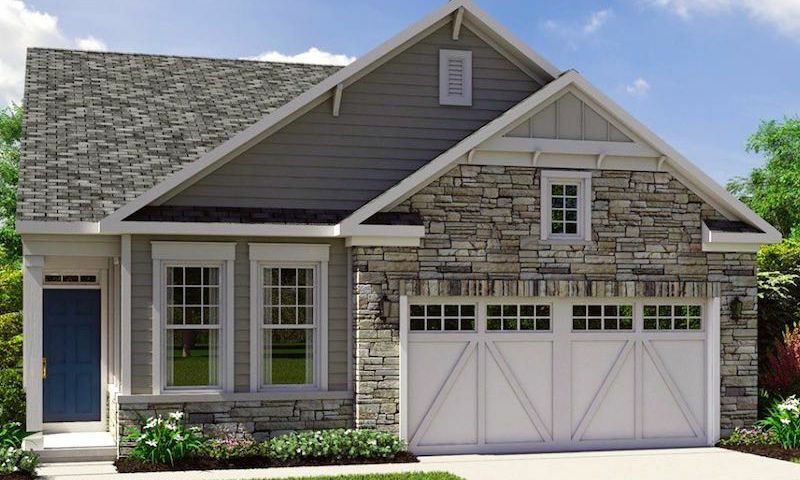 These homes will range in size from 1,747 to 3,664 square feet with two or three bedrooms, two to three bathrooms, and an attached two-car garage. Homeowners will appreciate that these low-maintenance homes boast designer cabinetry, granite countertops, and large walk-in closets. Living in Four Seasons at Monmouth Woods means enjoying a low-maintenance lifestyle in a friendly community. As residents start moving in, there are sure to be clubs, events, and socials to get to know new neighbors and share common interests. Once complete, the clubhouse will be the focal point of this community, providing areas to gather with friends or enjoy a game of billiards, tennis, or bocce ball. This age-restricted neighborhood will also provide residents with more time to do as they please thanks to the monthly fee that covers snow and trash removal, mowing, trimming and fertilization, as well as maintenance of common areas. Four Seasons at Monmouth Woods will be located in Howell, New Jersey just off West Farms Road. Homeowners will have easy access to Routes 9 and 33. Just around the corner from the community residents will find everything they need for everyday conveniences like The Home Depot, several restaurants, and grocery stores. Outdoor enthusiasts have the Manasquan Reservoir County Park and golfers have the Howell Golf Course just a few minutes away. New York City and Newark International Airport are both approximately an hour away. Active adults in Central New Jersey will love the lifestyle, homes, and location of Four Seasons at Monmouth Woods. There are plenty of activities available in Four Seasons at Monmouth Woods. Here is a sample of some of the clubs, activities and classes offered here. K. Hovnanian will develop Four Seasons at Monmouth Woods with twelve separate floor plans. Four will be loft style while eight will have single-story living. These homes will range in size from 1,747 up to 3,664 square feet with two or three bedrooms, two to three bathrooms, and an attached two-car garage. Homeowners will appreciate these low-maintenance homes, built by K. Hovnanian, with designer cabinetry, granite countertops, and large walk-in closets. K. Hovnanian is prominent and well established builder in the are who has built several beautiful Four Seasons communities. Monmouth Woods is in a convenient location set back off of Route 9, yet still close enough to access shopping. Downtown Freehold and the mall are less than 15 minutes away. 55places.com is not affiliated with the developer(s) or homeowners association of Four Seasons at Monmouth Woods. The information you submit is distributed to a 55places.com Partner Agent, who is a licensed real estate agent. The information regarding Four Seasons at Monmouth Woods has not been verified or approved by the developer or homeowners association. Please verify all information prior to purchasing. 55places.com is not responsible for any errors regarding the information displayed on this website.